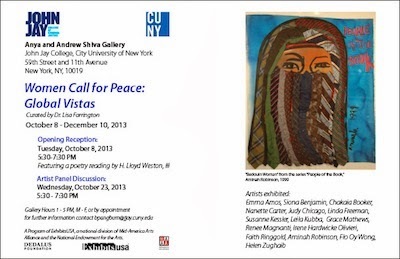 On October 23, 2013, an Artists Panel Discussion will take place in the Shiva Gallery from 5:30-7:30. The fifty three works in the exhibition offer stunningly beautiful but powerful statements of the artists’ commitment to peace on all fronts— personal, political, domestic, and international. Artists in the exhibition are Emma Amos, Siona Benjamin, Chakaia Booker, Nanette Carter, Judy Chicago, Linda Freeman, Susanne Kessler, Leila Kubba, Grace Matthews, Renee Magnanti, Irene Hardwicke Olivieri, Faith Ringgold, Aminah Robinson, Flo Oy Wong, and Helen Zughaib.